Combine almond milk and water in a large saucepan and bring to a low simmer (do not boil); turn off heat. 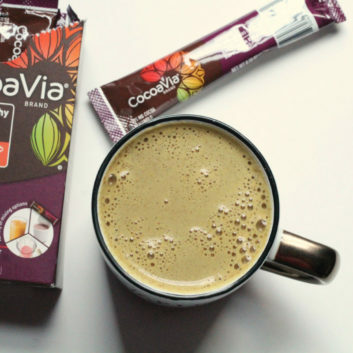 Whisk in honey, CocoaVia® supplement and remaining spices until thoroughly mixed (be sure all of the ingredients are well blended). Pour into a mug and enjoy! Optional: Top your Golden Milk Hot Cocoa with a squirt of aerated whipped cream and cinnamon. Note: 2 tablespoons optional aerated whipped cream adds approximately 15 calories, 1 g fat and less than 1 g sugar. Nutrition information can vary slightly based on brand.